It’s no secret we have a host of world-class fishing spots surrounding us. Whether you like to fish from the beach, fly-fish or drop a line from the boat, you’ll be rewarded by stunning untouched scenery, crystalline waters and no shortage of space to cast til your heart’s content. 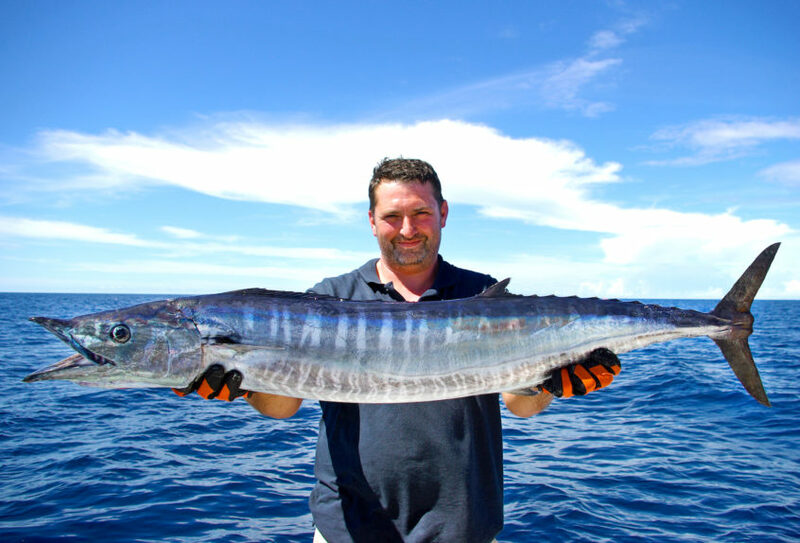 What makes fishing the Mackerel Islands unique? If you’re beach fishing, no matter what the conditions, there’s always a sheltered bay to be found. Our island crew are fishing aficionados themselves, and are only too willing to point you in the right direction. Their favourite techniques include sight casting while walking the beach, fly fishing the sand flats, ballooning for Mackerel off the point or simply casting some bait.If you have your own boat, we offer excellent services for guests to explore the surrounding waters for a hassle-free experience. With awesome fishing just a short distance from the islands, plus moorings, fuel and supplies, your day on the blues will be smooth sailing. To cap it off our crew will be there to welcome you back to shore safely. See here for more. Don’t own a boat but are hankering to find a charter that isn’t overcrowded? Our fishing charters are for you. Unlike most, we cater for small numbers (up to 8 only) with our skipper devoted to coaching the crew to ensure everyone gets the most out of the day. There is never a dull moment – we regularly have 2-3 people pulling in fish while Skipper is directing someone else to cast out a lure to secure another hook up. Our charters are not limited to where we go or the type of fish we chase. We bait your hooks, tie the knots and fillet your fish! Everyone goes home with a tail or a tale – either way you’ll return with a grin. Q. How did you discover fishing to be a passion? A. At the age of five fishing for mullet at the local jetty, been hooked ever since! Q. Best fishing tip / joke? A. You won’t catch fish with a beer in your hand. Keep changing it up – lures, colors, hooks, bait everything you can, until something works (and be patient). Two fish got in a fight, one got battered! A. Catching flat head and whiting with my Dad in Victoria when I was around 4 or 5. Q. Parts of Australia you have fished? A. Arnham Land on the Roper River, my first Barra was 1200mm long! A. Stay sharp! Sharp hooks, a sharp knife and a sharp wit. Keen? See our price list here. *Flights are now available direct between Perth and Onslow via Virgin. Hi there! We’re not exactly sure which camera was used in this image but we do know it wasn’t taken on a phone camera. At the time we had members of staff with fairly sophisticated digital camera equipment, and they were very talented at capturing action, nature and wildlife moments. Sorry we can’t be more specific, but hope this helps.